Will You Join The Harvest? “If the hay is damp when it is stacked, it can get hot inside the haystack and burst into flames. But I think it’s okay. It’s been laying in the field for a week now. If we don’t get it in tonight, we’ll lose it anyway, because it’s going to rain. So let’s get busy.” Dad grabbed the pitchfork, mom grabbed a rake, and my brother and I began scooping up big piles by hand and throwing them into the truck. It wasn’t much of a field – only three acres. But we needed the hay for our cows. There was a mist across the moon, a warning of rain to come. We all worked hard and without many breaks, piling the hay into the truck, driving it to the barn, unloading it then returning for more. It was exhausting. By the time the moon went down, we had the hay in the barn. We had raced against time and had beaten the rain. Harvesting is hard work. But if we don’t get it in, we lose the crop. In today’s instant world, we have forgotten the work that goes into harvest. Someone else gathers the crops and brings them to market. The urgency of harvest no longer touches most of us. Each generation presents a new spiritual harvest on earth. Yet many Christians have lost the sense of urgency toward the lost. We live in a world of spiritual pain and suffering, where the lost do not know where to turn for answers. Large numbers of children across America are growing up with no knowledge of Jesus. How many would gladly run to Jesus . . . if we would tell them about him? On Sundays, many Christians are content to go to church, listen to the pastor preach and then leave, considering their spiritual duty to be done. But that is not Jesus’ message. He asks us to help him with the harvest. He set the example for us in what he did while on earth, to show us how to reach the lost. The Harvester calls to each generation of believers: “Come! Help with the harvest!” This is not the preacher’s job: it is ours. Age does not matter. Children and elderly alike can help gather souls for God’s kingdom. Look around! We are surrounded by a world in desperate need of Christ. “The harvest is ripe!” Jesus is calling to us. Will we help? Join the Conversation: How are you helping with the harvest? I missed a big opportunity. God handed it to me on a silver platter. Well, to be more accurate, it drove up in a silver pickup truck and stopped right beside me. But I let it get away without a fight. I really blew it. “Ma’am?” Oh, does he mean me? I turned to see a young man sitting in a pickup truck, now directly between the store and me. His window was down and he was looking directly at me. And there wasn’t anyone else close by. I thought about looking around for a hidden camera. I mean, really? He was sitting in front of a bookstore. Surely this was a joke. “Seriously?” I asked. “Lifeway is right there,” I pointed as I declared the obvious. But I could tell the cowboy had no idea what Lifeway was by the look on his face. “Uh, it’s a Christian bookstore,” I stammered. Half statement, half question. Still no recognition. “I’m looking for self-help books,” he added hopefully. Okay. God threw the door of opportunity wide open, but I slammed it shut. I stumbled around and told him I didn’t know the area – which I didn’t. That I had a friend waiting in the car – which I did. Then I suggested he try Sam’s, which was close behind us. By the time I got to the car, I was kicking myself over the lost opportunity. As I began to tell my friend about the encounter, all sorts of better responses began to pop into my head. There’s a Book in there – I would be pointing at Lifeway – that will give you help that lasts for eternity. I have a Friend that can help you with anything and everything – of course, that would be Jesus. I can’t tell you how many times I’ve quoted or taught or written about Peter’s encouragement to always be ready to share Jesus. This guy needed hope. He was actively looking for it. He even asked me where to find it. I know the One who is our ultimate, eternal Hope. I blew it. But, I’m praying today that God will give me another opportunity. Maybe I’ll head to Lifeway. About the author: This post is adapted from Kathy Howard’s Bible study. 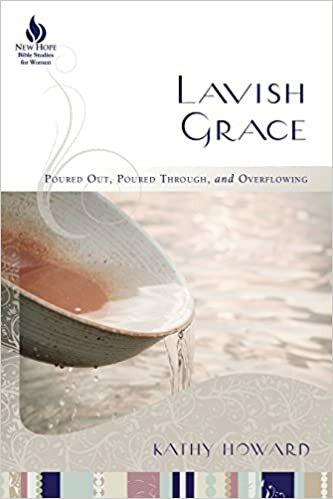 Lavish Grace: Poured Out, Poured Through, and Overflowing. Lavish Grace is a 9-week journey with the apostle Paul that helps readers discover God’s abundant grace for their daily lives and relationships. You can find out more about Kathy, her speaking and writing, and find free resources at www.KathyHoward.org. Join the conversation: Do you regularly pray that God will give you opportunities to give the reason for the hope you have? By the time I reached the store, my heart overflowed with the knowledge that Jesus’ blood shed at Calvary held a supernatural drawing power for those who so desperately needed him. I entered the store and looked around, the music still ringing in my spirit. Finding some items, on my way to the dressing room, I cheerfully told the clerks that my new book, The Prince And The Plan, had just been sent to the printers. 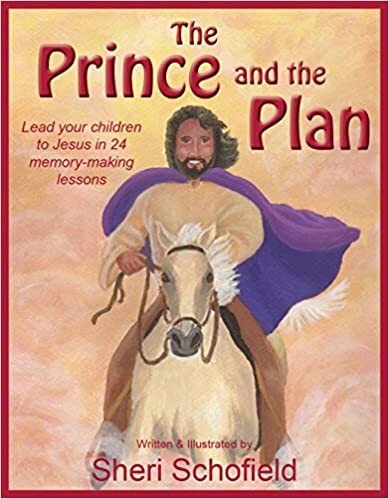 As my friends, they knew something about this book on the plan of salvation I’d written for children. “Yes!” I told her how God put all the sins of all mankind for all time on Jesus that day at Calvary. How He punished Jesus instead of us for those sins. And if we believe in Jesus and accept his free gift of salvation, we are made holy in God’s eyes. We become new, clean, holy people! The power of the blood of Jesus had taken away her inhibitions and overwhelmingly drew her into the grace of God. She had recognized that tremendous, supernatural power of the Holy Spirit in me. I believe the Holy Spirit is preparing to pour that power out on Christ’s devoted disciples in this world, for Jesus’ return is very near. Let there be one last sweep of revival, Lord! Join the conversation: Have you experienced the supernatural power of God?